Pinestraw casting is a fun way to create interesting (and pretty) pendants. What could be nicer than a chuck of solid Sterling Silver? Each one is different, so you'll have a one-of-a-kind silver creation! Just add a necklace. My intent is to show off nature's magnificence, not camouflage it with too much wire. This would make a unique one-of-a-kind gift. It will arrive in a silver box ready for giving to that special someone, even if the special someone is you! 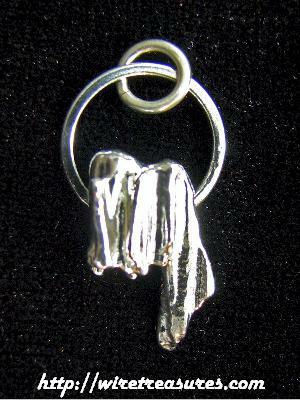 If Silver is one of your favorites, then click here to see all of the Silver items on the site! You are visitor number 135 to this page.